In the 1960’s Vinyl Flooring made its debut and replaced linoleum by quickly becoming the flooring industries top seller. Because there wasn’t really a lot of explanation most still decided to deem it linoleum, however the two couldn’t be more different. Even though both are durable, linoleum just doesn’t stand up to vinyl on a residential basis. Today, we will be discussing vinyl flooring and how far it has come since inception. Vinyl flooring has an amazing range. It is bright and poppy or subtle and rustic. The design possibilities with vinyl are literally endless. When vinyl flooring first made its appearance it was only available in sheet form, but so much has changed since then. Now you can get a vinyl tile that can realistically replicate almost any flooring material with the exception of carpet. Reason 1 – Depending on a families budget, they may or may not have enough money to purchase a hardwood or stone tile floor. Vinyl gives these families a cost effective solution to having the floors of their dreams without breaking the bank in the process. 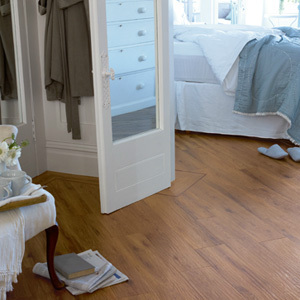 Reason 2 – Vinyl flooring doesn’t have a lot of issues with certain areas of the home. Unlike carpet and hardwood flooring; bathrooms, kitchens, mudrooms and even basements are not an issue for installing vinyl flooring. What material is vinyl flooring it made of? The easiest answer to this question is polyvinyl chloride, more commonly known as PVC which we have all heard of. This material is practically indestructible on the surface, which is why PVC piping is used in constructing a home, because it is cheap and highly durable. 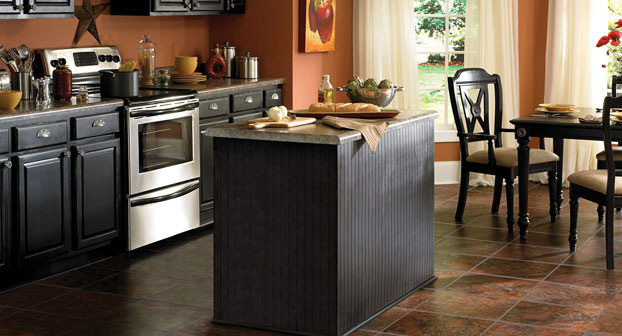 Don’t let the durability fool you though it is much more softer underfoot than other hard-surface flooring materials. Fiberglass is a fairly new material that has been added to vinyl flooring’s makeup. This has been added to balance even more comfort and durability in the floor.